What if I told you that you have probably been measuring food incorrectly for your whole life? There are times in life where we begin to question various elements of our realities. Often, we reevaluate these elements out of consistent frustration with a process or situation. You measure out a cup of flour. I measure out a cup of flour. We weigh your cup of flour and we weigh my cup of flour. Yours is 10 g more than mine. Why? It all comes down to varying packing density. In order to understand varying packing density, we need to think about the individual molecules of what we’re trying to measure. We need to also consider that each time we scoop a cup of flour, we get a unique arrangement of these molecules in the measuring cup. These arrangements take up varying amounts of space, and this is what causes the inconsistency that we are trying to get away from. To illustrate why we get these unique arrangements that are the same in volume but different in weight, we need to look at some of our ingredients close up. 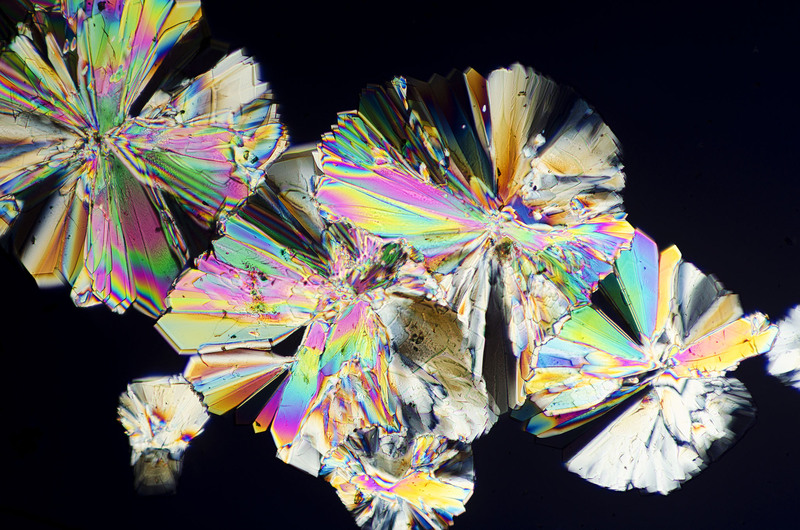 This is a picture taken through a microscope of dextrose sugar crystals. Look at their jagged edges and varying sizes. The jagged edges on these crystals cause them to lock together in different ways, leaving different amounts of space between each crystal. The varying amounts of space between individual molecules is exactly what causes your cup of flour to be 10 g more than mine. Measuring by weight ensures that each ingredient gives the desired intensity to the dish, because once the ingredient is dissolved or fully incorporated, the volume it takes up becomes irrelevant. More photomicrographs of ingredients we use? Sure, why not! 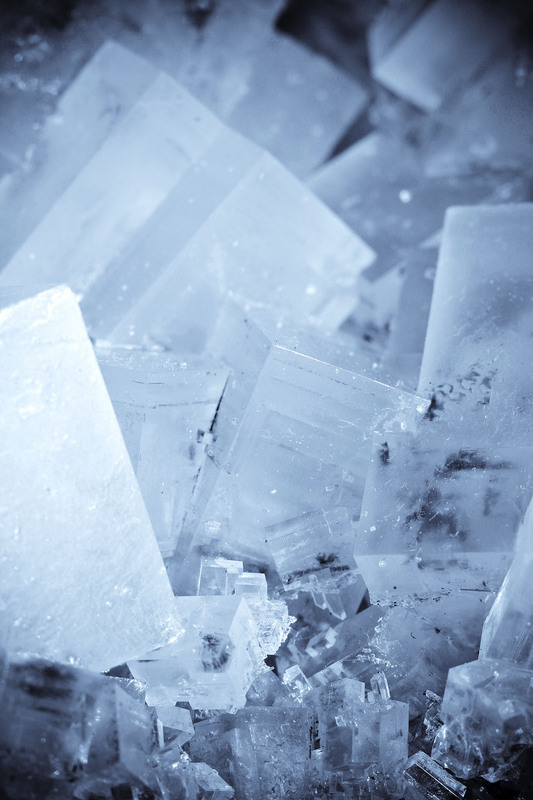 This one is of salt crystals. A cook makes a stew that is so awesome that he or she is compelled to write a recipe to share with the world. The cook then writes a recipe with the ingredients listed above. A novice cook making stew for the first time tries to make the recipe. The novice cook gets all of the same ingredients, prepares them the same way, and puts them all together as per the recipe. Here’s where it all goes wrong. 1 medium onion – white, purple, yellow? How big is medium? Why do we write recipes where the outcome of the meal is based on hoping that we got the right ingredients and sizes of ingredients? No wonder it all goes wrong in the kitchen! This is a very real struggle for most home cooks and I feel it is the reason you often hear people saying “I’m a terrible cook” or worse yet, “I hate cooking.” Most of us have seen ingredient lists for recipes just like the one in my example, in almost every cookbook published. When you take a closer look at ingredient lists for recipes, you realize how truly vague that most recipes are. Now we have a definitive quantity of each ingredient. Imagine how much more repeatable recipes would be if they were all written with measurements by weight! If you’re not already sold on measuring by weight, here’s yet another reason it’s awesome – you’ll wash fewer dishes. Think about making salsa by weight. You would have a scale with a bowl on it. You’d be chopping ingredients on a cutting board, adding the correct amount of each to the bowl, and when they’re all in the bowl, you’ve only dirtied a cutting board and knife to prep the dish! This is much better than having a pile of measuring scoops and measuring spoons to wash, along with the cutting board and knife! To me, the most liberating feeling from cooking by weight comes when you measure a mixture of liquid ingredients, dry ingredients, and oils. No longer will you have to dry out the measuring cup you just measured liquid in before you have to measure out a dry ingredient in the same measuring cup! No longer will you have to wash the tablespoon you just measured oil in and dry it before you can measure the next ingredient in the same measuring spoon! I recommend having two different scales. The scale I use for weighing out larger ingredients (potatoes, carrots, beans, etc.) has a 5.5 kg maximum capacity and a resolution (the smallest unit of measurement precision) of 1 g. The other scale that I use is for weighing out small quantities of ingredients (salt, pepper, fresh herbs, etc. ); it has a maximum capacity of 500 g and a resolution of 0.001g.